The spreadsheet and maps have been updated. The weekly Haynesville Shale rig count showed a one rig increase to bring the running count of working rigs to 151. That figure is 33 rigs lower than the peak rig count achieved July 30, 2010. The weekly Baker Hughes rig count showed a 19 rig increase, bringing the total number of working rigs in the U.S. to 1,732. 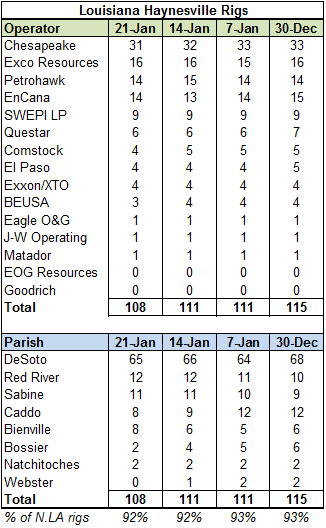 This week, there were net 11 new oil rigs (809), seven new gas rigs (913) and one new miscellaneous rig (10). By type, there were eight new vertical rigs, seven new horizontal rigs and four new directional rigs. In the Haynesville Shale region, inclusive of other formations, the rig count was up four to 177. Louisiana (117) held steady while Texas (60) increased by four. 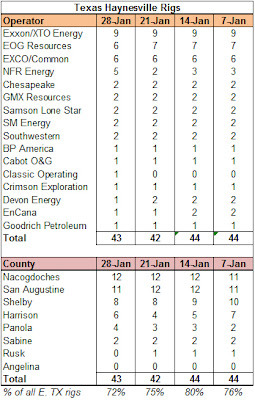 Look for the detailed Haynesville Shale rig count late this afternoon/early evening. I've started to get excited - at least a little bit - about the prospect of LNG export from the U.S. Outside of the Kitimat project in western Canada, the closest possibility of realizing LNG export is converting import facilities at Freeport, TX and Cameron, LA to export terminals. It is not a short-term fix to gas prices, as the first facility is at least four years off on the best timeline. Lest I get too excited, I've got the New York Times to bring me back to reality. An article in today's edition about Cheniere Energy (owner of the Cameron, LA facility) discusses the pros and cons of the conversion and paints the CEO of the company as something of a speculator. More than anything, it reminds me that to create a viable market for natural gas in North America, we have to start at home through organic growth and capturing market share in power generation and transportation. Export is nice (although it might eventually throw a wrench in pricing and demand), but progress starts at home. 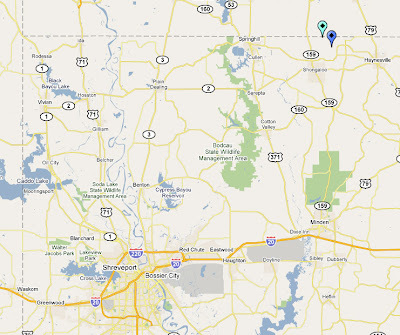 News came yesterday that private equity investor KKR purchased a chunk of Barnett Shale property from Conoco Phillips. 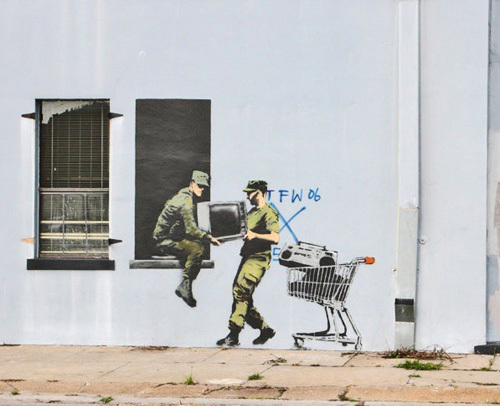 The quantity and price were undisclosed, but the assets have total net proved reserves of 93 Bcf. The land purchased was in the southern part of the Barnett Shale in the dry gas area. 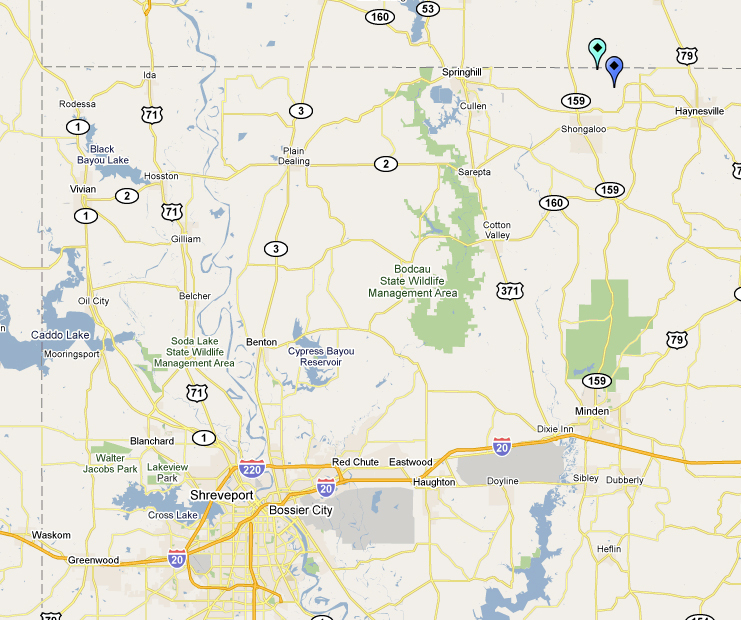 Conoco Phillips retained its acreage in northern part of the play where gas is found with natural gas liquids and oil. KKR made the acquisition through a recently formed venture KKR Natural Resources, a partnership formed last year with Premier Natural Resources. I'm sure KKR got a pretty good price for the acreage since dry gas has fallen out of favor with producers, but it might be a smart long-term buy for the investor. Dry gas assets fit squarely in the strike zone of many patient investors: it is a currently out of favor asset that has strong long-term potential. The assets can be bought on the cheap now and if the investor has deep pockets, they can be held until the value is realized. The weekly EIA working gas in storage report showed a 174 Bcf net withdrawal to bring storage levels down to 2.542 Tcf. The weekly withdrawal was 60% higher than the withdrawal this week last year (-109 Bcf) and 14% higher than the five year average (-152 Bcf). The current storage level is 9 Bcf higher than this week last year and only 29 Bcf higher than the five year average. That's a big improvement in two weeks. The average temperature last week was considerably colder than this week last year (-5.4 degrees), which is the first time in four weeks that the current temperatures were colder than last year's bitter digits. It was, however, slightly warmer (+0.7 degrees) than the normal temperature for this week. At the end of the press release: "The Company has also begun to actively explore opportunities to joint venture with third parties in the future development of its Haynesville/Bossier and, separately, its Cotton Valley Sands undeveloped acreage." I've had my concerns about the company's ability to finance a Haynesville drilling program, especially at low commodity prices. They may have to give up some upside, but a partner could help fund a program to drill the company's 61,528 gross (44,032 net) acres. With the company juicing its reserves at year end, the deal might look more attractive to a third party. The Haynesville Shale rig count dropped by five to 150. 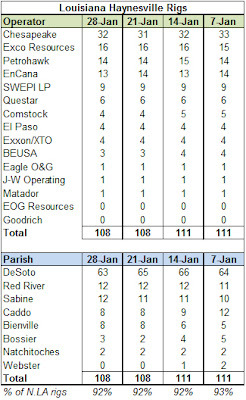 Louisiana saw three fewer rigs (108) and Texas two fewer (42). 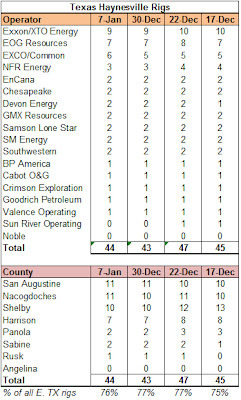 Site Change: Full Haynesville Rig Count on "Snapshot"
FYI: Since I have been calculating the Haynesville Shale rig count for one year, I have updated the "Haynesville Shale Snapshot" graphic at the top of the page to show the full Haynesville Shale rig count instead of the north Louisiana count. "Transit officials estimate that the elimination of diesel engines has reduced the release of cancer-causing particulates from the bus fleet by 80% and greenhouse gases by about 300,000 pounds a day in one of the smoggiest areas of the country." Los Angeles is not the first city to fully scrap its diesel fleet, but it does have the largest collection of CNG buses in the country. The weekly Baker Hughes rig count showed a 13 rig increase, bringing the total number of working rigs in the U.S. to 1,713, the highest level it has been since December 26, 2008. The number of oil rigs increased by nine to 798, gas rigs increased by four to 906 and miscellaneous rigs held at nine. By type, Directional rigs were up 14, while horizontal rigs were down one and the number of vertical rigs was unchanged. 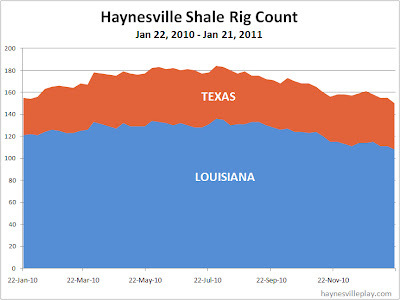 In the Haynesville region, inclusive of other formations, the rig count was down by three to 173. The Louisiana count was down four to 117 and the Texas count was up one to 56. The weekly Baker Hughes U.S. rig count was unchanged for the week, holding at 1,700. 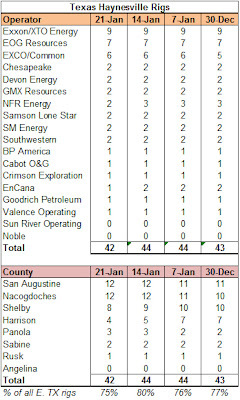 While quiet at the surface, there was a net exchange of 12 gas rigs for oil rigs, as the number of gas rigs fell by 12 and the number of oil rigs gained 12. By type, there was an increase of eight directional rigs and one horizontal rig, while the number of vertical rigs dropped by nine. In the Haynesville Shale region, inclusive of other formations, the rig count dropped by two to 176, with a one rig increase in north Louisiana to 121 and a three rig decrease in east Texas to 55. The regional count hasn't been this low since December 11, 2009. The Louisiana Mineral Board's monthly lease sale was pretty unremarkable from the perspective of the Haynesville Shale. Only 48 acres of leases were successfully bid upon with an average bonus price of $4,275 (weighted average $3,790). Another 633 acres of land in Caddo Parish in township 17, ranges 13 to 15, received no bids. The bid packages were made up lots of small parcels in and around Shreveport, so it's not a big surprise that nobody bit. Two other parcels containing 152 acres in Sabine Parish received low bids ($2,600/acre and $5,011.50/acre, respectively) and were not awarded. 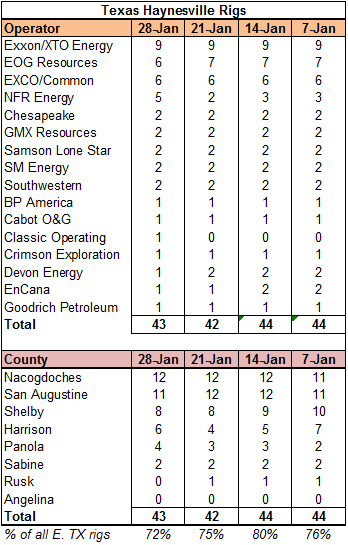 The weekly Haynesville Shale rig count fell by three rigs to 155 working rigs. The count fell by four in Louisiana to 111 and increased by one in Texas to 44. 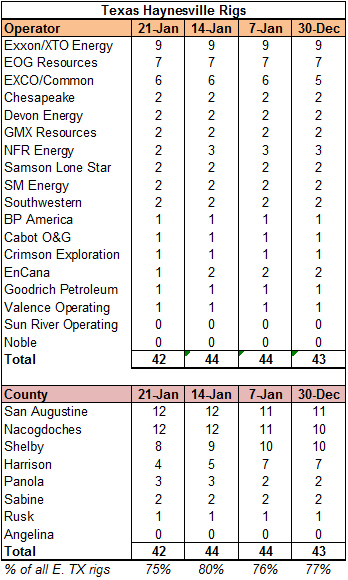 The weekly Baker Hughes rig count showed a six rig increase to an even 1,700. Oil rigs were up 12 to 777, while gas rigs were down five to 914 and miscellaneous rigs were down one to nine. By type, horizontal rigs were up 19, while vertical rigs dropped by 12 and directional rigs decreased by one. Horizontal rigs now represent 56.8% of the rigs operating in the U.S. today, a record high. In the Haynesville region, inclusive of other formations, the rig count dropped by one to 178. 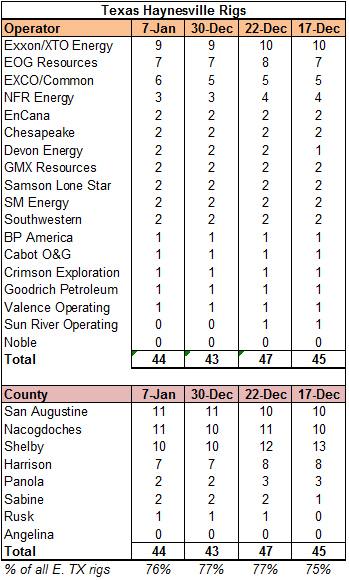 There were three fewer rigs operating in north Louisiana (120) and two new rigs in east Texas (58). Yesterday, Chesapeake Energy released its preliminary 2010 operating results and 2011-12 strategic and financial plan. I'll spare you the numbers, but I found two interesting takeaways. First, Chesapeake has now hedged approximately 96% of its expected 2011 natural gas production at the average price of $5.84/Mcf. 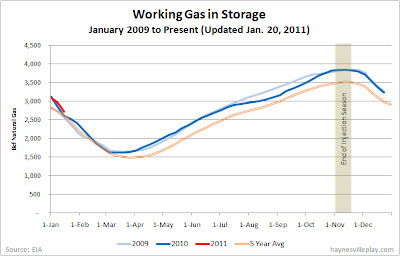 For 2012, the company has hedged approximately 17% of its expected natural gas production at an average price of $6.19/Mcf. Not bad prices considering the market uncertainty and general malaise of the natural gas commodity market. Interestingly, the company has only hedged 5% of its 2011 and 1% of its 2012 expected oil production. They are on board with T. Boone Pickens in expecting oil to rise above $120/barrel. 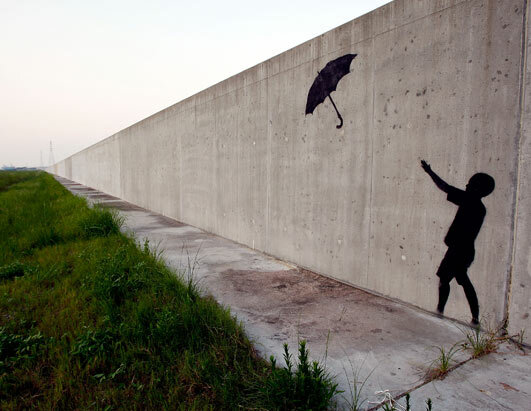 Second, the company announced a new strategic and financial plan called the "25/25 Plan." Chesapeake will reduce its long-term debt by 25% and cut its production growth rate to 25% (from a planned 30-40%). How? First, the company will continue to monetize its assets. These deals will reduce net production going forward and bring in up-front cash to pay debt. To the relief of shareholders, Chesapeake says it will not issue any common or preferred stock to achieve the objective. Second, the company will cut back on leasehold spending. Last month I noted that Comstock plans to spend $522 million on capital expenditures in 2011. The table below shows the company's proposed breakdown by location of its spending in the Haynesville Shale, where it has allocated $348 million (67% of the budget). 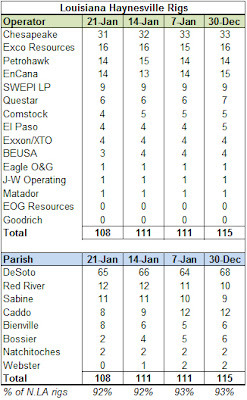 I've seen some chatter about a farm-out or joint venture deal for some of Comstock's Haynesville acreage, but I'm not sure if a deal is figured into the 2011 capital budget. Sounds like a deal might be imminent. The weekly working gas in storage report showed a 135 Bcf decrease, bringing the current storage levels to 3.097 Tcf. The weekly withdrawal was slightly below last year's 149 Bcf withdrawal (remember how cold January was last year?) but significantly higher than the five year average of 79 Bcf. Temperatures across the country were only slightly colder than normal in aggregate (and slightly warmer than last year), but temperatures in the Southeast U.S. were 6.9 degrees below normal for the week.